Stephen Davis has written nearly 20 books about music, including the Led Zeppelin book, Hammer of the Gods and the brand new Gold Dust Woman: The Biography of Stevie Nicks. In this edition of Music Is My Life, the author shares his personal memories of Bob Marley, Michael Jackson, and why you don’t want to piss off Stevie Nicks’ fans. 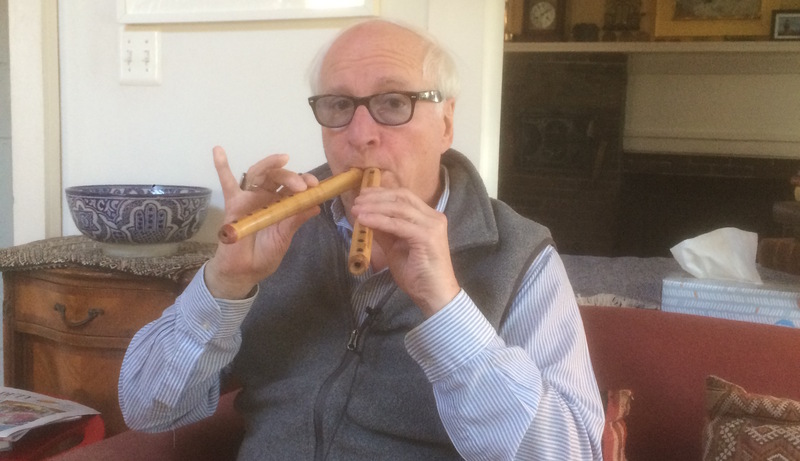 He also discusses his life-changing trip to Morocco, where the Master Musicians of Jajouka taught him how to play the pipes he’s pictured playing at the top of this post. Stephen Davis: When I was eight years old, a black car pulled up to the front of our house on Long Island and a man—a priest—got out, wearing a Roman collar and my mother answered the door and he said, “My name is [Father so-and-so], and I’m from the local Episcopal church and the music teacher at your son Stephen’s school says that he has the best voice in the school and we want him in the choir.” And my mother said, “Oh,” you know, “I don’t know,” and “we’re not Episcopalian,” and the priest said, “And it pays $20 a month; two rehearsals and two services a week.” And this is 1955 or ‘56 or something like that, and that’s good money for a kid. A lot of comic books and milkshakes. And so, for the next three years, I was a trained, professional chorister at the Episcopal Cathedral on Long Island, New York and I learned to sing, and learned to sing well with other people, and that began my lifelong love of music. So, before that car pulled up, were you genuinely really excited about it anyway? My father was a big music fan. And so, my mother would listen to the radio all day and my father collected jazz records, Miles Davis, I grew up with that stuff, and, you know, the more commercial side of ‘50’s jazz. I didn’t really get excited too much about music, per say, in terms of buying records until I was about 10 years old and the Kingston Trio came along, this is ‘58, ‘59, and I wanted to have all those records. I mean, they influenced everybody from Bob Dylan to Lindsey Buckingham to almost anybody who was alive then. And then the early ‘60’s come around and Kennedy is . . . there’s a bloody, public assassination and the nation’s hopes are foundering and three months later, as if in response—a call to summons!—The Beatles show up on The Ed Sullivan Show and kind of changed everything. But I’ve always thought, as someone who writes about music, I’ve always thought that, in the long run, the advent of The Beatles won’t be the main music that that era is remembered for because this was also when Brazilian music came north and bossa nova entered the American culture in ‘62, ‘63, ‘64, with these incredible records. And were you getting into them at the time? They were all on the radio, my father was buying the records; jazz, samba, Getz Au Go-Go, Getz/Gilberto, Astrud Gilberto’s solo records, Luiz Bonfá’s records, I mean, we had them all in the house and I was like, as mesmerized by that music as I was by the advent of The Beatles. But anyway, I sang in high school, I went to Boston University. And was writing also a throughline, as well as music? No, not yet. I wasn’t really a writer until I went to Boston University. Boston University was great because it was this giant place in the late ‘60’s and it was . . . I didn’t really go to class because we went to demonstrations instead. I burned my draft card on the steps of the Arlington Street Church with about 100 of my friends. And … about 1,000 people there that day, this is 1967 and at the same time, this is when all the San Francisco bands started coming to Boston and playing at the Boston Tea Party; The Grateful Dead, the Jefferson Airplane, Big Brother, The Holding Company, which was Janis Joplin’s band. And all these incredible . . . you know, [it was an] organic movement unto itself and you know, you hadn’t really seen this before . . . families of bands from one town. And they came through and it was just mind boggling. At the same time, the bands were coming through from England, most notably, Led Zeppelin. Fleetwood Mac was the house band at the Boston Tea Party in 1968. With these books that I’ve read of yours, I can feel from the writings that you were there at a lot of those early ones, right? Yeah, taking notes. I started writing for the college paper at Boston University, which was one of the largest circulation university papers in the country, and I started writing about music, mostly in order to get free tickets. That is a funny thing and I feel like you do deal with that in a lot of your works, like in Hammer of Gods when you’re talking about how Zeppelin was so frustrated that it was the original rock generation’s younger brothers and sisters? Yeah . . . the older baby boomers weren’t programmed to like Led Zeppelin. It just sounded like someone screaming, you know? But man, my little brother! . . . The men don’t know but the little brothers understand, you know? So now, during this time you’re writing about all of this music and you’re starting to feel like that’s something you can do as far as shows . . .
And were you also playing still? And singing? I dropped out of singing and playing music until later. But in 1969, I wrote the first front page story of a new paper called The Cambridge Phoenix, which later became The Phoenix, which later became The Boston Phoenix. It was The Real Paper. . . . It was a split off. I was there too, but the fact is that music was so big in Boston, it was such an important part of student life and just the people who lived here, that there was enough advertising from people selling stereos and amplifiers and guitars and tickets and anything related to music, that two competing weekly papers showed up in Boston. One was called Boston After Dark or BAD and the other was The Boston Phoenix and these were fat. We were publishing 80-, 90-page papers every week, and there were two of them. Yeah. And were you writing for both? No. I was writing for . . . The Phoenix. And then, we had a guy writing for us who, called Jon Landau, who was also a big music editor at Rolling Stone and when he went to Rolling Stone full-time, I became the music editor of The Phoenix and then I became the associate editor of Rolling Stone. He hired me. . . . The only thing I have in common with Bruce Springsteen is that we were both invented by Jon Landau and so, that gave me, at age 22 or something like that, a national forum, because Rolling Stone was kind of “it,” you know? Yeah. And were you still in school then, or were you…? No. I was living in Cambridge with my girlfriend and her dog and various photographer friends, in a, kind of a communal scene in Cambridgeport. Were the rents really cheap at that point, or was Cambridge always Cambridge? Yeah, it was $180 a month for a whole house, a beautiful house near the B.U. bridge, it was great. . . . It was a very lucky time for us to be alive and doing that because . . . for a young writer like me, [there were] only a few things you could write about and make a living out of; one was politics, one was sports, and the other was music. Or you could go to Vietnam and be at war, of course. . . . But, you know, none of that stuff appealed to me except . . . writing about music, and hanging out with musicians, and smoking dope, and living that life, and going on tour with bands, and stuff like this. So you burned your draft card and your number never got called? No, I had a draft physical later on. And they said, “Where’s your draft card, son?” And I said, “Well, I burned it on the steps of the Arlington Street Church.” And they said, “Well, step over there.” And I also had a, you know, I mean, like many people . . . I knew a doctor who wrote a letter for me. And if you didn’t want to go to Vietnam, you didn’t really have to, you know? Unfortunately, 55,000 people didn’t know that and [my friends and I] were talking about this the other day, a lot of people are not enjoying their grandchildren today because, you know, whoever started this. I blame JFK, but that’s another story. . . . Anyway, music! I left Rolling Stone after a couple of years. My job was to . . . do the record review section. . . . And so I met all the other writers; they all had to come through me. And . . . me and Landau worked out of the New York office, not San Francisco. And I mostly worked out of home. So I never had anything to do with the office politics or anything. . . . I met Jann Wenner maybe once, you know? . . . But again, it gave me this national audience for my stuff, you know? At age 23, 24. . . . And so, when I left Rolling Stone, I started writing for The New York Times about music: Front page stories on Sunday, you know? I had a friend called Robert Palmer, Bob Palmer, he was the chief music critic for The New York Times, and he came back from a vacation in Morocco and he said, “Well, you’ve got to go to this village of the master musicians of Jajouka. These are a 2,000 year old rocking band.” He actually said, “This is a 5,000-year-old rock ‘n’ roll band that was discovered by Brian Jones of The Rolling Stones.” And the first record on Rolling Stones Records was Brian Jones Presents the Pipes of Pan in Joujouka and [I go], “Well, where is that?” And he says, “Oh, it’s in the hills south of Tangere.” I go, “Oh, oh alright I have to go.” He says, “You have to go. It’ll completely change your life.” So I wrote a proposal to National Geographic and they sent me and a photographer first class to Morocco, [we] hired a car and made our way into the reef and into the Gibala foothills and spent six months with the master musicians of Jajouka. And they taught me how to play music. Flute, drums, everything. I was just immersed. . . . All they did was smoke kef and play music all day. . . . And then they would go to these festivals. Well, back then, there were 30 master musicians; 15 guys playing the rita, which is like a double reed oboe, and 15 guys playing the drums. And it was the 5,000-year-old rock and roll band. I mean, their music had . . . was descended from . . . you know . . . stuff that had come from Damascus, you know? When the Arabs moved west in the ninth century, and some of the rituals that they do recall Roman rights like the Lupercalia, where you dress up in goat skins and you whip the women for fertility. I mean, this is pretty serious stuff. I wrote a book about it years called Jajouka Rolling Stone years later. But in any case, I came back; I left a writer and I came back a musician and that’s what really changed my outlook on music and the commercialization in music and, you know, kind of what it was all about. I took along a friend of mine, Bob Palmer, this writer who said, “Take along this guy, he speaks fluent Arabic.” I speak fluent French, the photographer spoke Spanish very well, so between the three languages, you know, we just, we got along real fine. But it was mostly the language of just music and, you know, I was in my twenties and most of these guys were in their . . . fifties and sixties, and had fought with Franco . . . in the Spanish Civil War. But it was just great and the food, the music, the people, the goats, everything. It was just one of these life-enhancing experience, and again, I came back a musician. . . . I came back able to play things on the guitar that I couldn’t play before and it was magic; and, you know, just part of my legendarium. Around this time, reggae was hitting, so I went right off to Jamaica and started hanging out with Bob Marley, and that’s where my first book comes from, Reggae Bloodlines. Not just Bob Marley, but the whole movement. It was 1974 or ‘5, and there was this cultural shock wave coming out of Jamaica; not only music, but politics, you know, a socialist prime minister, the CIA was down there . . . undermining him. There were food shortages, tanks in the streets, and meanwhile, Bob Marley’s at home pumping out . . . this incredible . . . revolutionary music and Burning Spear and Jimmy Cliff and The Meditations, Heptones, so I got really into reggae. Now did you know, coming off of the trip to Morocco and then going to Jamaica, did you know—you knew that the first one was an amazing experience while you were in it—but did you know when you were in it as soon as you got to Jamaica, that this was something, you know? My family has a long history with Jamaica. My grandmother used to go there when I was a kid, so I’d heard a lot about it, you know? I’m a big James Bond fan, so I’d read Ian Fleming’s books that take place in Jamaica. So I kind of was prepared . . . I had arranged a really nice house in Kingston. And we had a . . . I neglected to say that the reason that we went there the first time was to write an article for The New York Times. . . . But this was seen by an editor at Doubleday and she gave me and my photographer friend, Peter Simon, a pretty good advance. So we were flush with cash, we went down to Jamaica, we stayed for months and again, we’re hanging out with Bob Marley and his crew and Burning Spear and all these contemporary guys, driving around the island, going up to the mountains to visit the ganja farms, hanging out with prime minister Michael Manley because we had an assignment from The New York Times magazine as well. But it was mostly just the music. But at the same time, reggae couldn’t get played on the radio in Jamaica because the JBC—the broadcasting company—wanted to play like The Commodores, disco music. So there was this tension in Jamaica. In the early days, Bob Marley and his pal Skill Cole had to take cricket bats to the radio station and tell the DJs, “If I don’t hear my record in an hour, we’re going to work on your car.” And a lot of windshields got smashed before Bob Marley got on the radio in Jamaica. So there was this . . . it wasn’t a tourist paradise, you know? It was really a contentious . . . battlefield in Kingston. Did they take you in? Oh, very much so, yeah! There were also people who were saying that we were there to steal their culture. But we didn’t care . . . We were young and dumb, you know? And we could always just say, “Look . . . we can go back home and write about the commodores and make more money than we can writing this stuff, but we’re giving you guys a platform.” And of course, within two or three years, people started hearing reggae on TV commercials, you know? Wings was incorporating it, and everybody had to have their reggae song . . .
Everybody had a reggae song! Even Led Zeppelin tried to, had a crack at it, you know? At this point you’ve written Reggae Bloodlines and while you’re down there, are you realizing,“This is my career! I can do this as a living!”? Yes. . . . Because I had an assignment for the Time magazine, and they published my interview with the prime minister, so I thought to myself, “Well, I could always go back to . . . writing about current events or something if this reggae thing doesn’t work out,” but it did. And then after that, I did a book called Reggae International. After that, I started working with Bob Marley on his memoirs, interviewing him, and then he died. And I finished them by myself and around this time—so this was in the early ‘80s—and when Bob Marley died, I had a really good literary agent and he called me up and he said, “Look, Bob Marley just died. I can get you . . . this much money for a biography.” I said, “That’s incredible, that’s great.” And he said, “Not only that, but,” at this time, there was only one rock book out there and it was called No One Here Gets Out Alive and it was a terrible biography of Jim Morrison. Danny Sugerman and someone else, and the operating premise of this book was that Jim was still alive somewhere, waiting to return like Osiris or the Imam or whoever. So my agent said, “Look, all these rock bands are going to have legends, and you’re perfectly positioned to be the guy who writes these legends, I mean, for the rest of your career, you can write stories about these rocks bands.” And I go, “Okay, that’s fine with me. Let’s start with Bob Marley.” And so I went back to Jamaica and started interviewing people and the book came out here and in England and then in Japan, and then in France and then all over the world. And that was it, that was my course, write the legends of these guys. The next one was, I went on tour with Led Zeppelin for a while and out of that came Hammer of the Gods, you know, still in print 32 years later. And then I started getting calls, my agent started getting calls from people like Levon Helm and Mick Fleetwood and Michael Jackson to do . . . “as told to” or ghost-written books. . . So I did that for 10 years, then went back to writing about bands. . . . I did a biography of Jim Morrison, the Levon Helm book, which is called This Wheel’s on Fire, the Michael Jackson book was called Moonwalk, number one bestseller in the world. You did that with him too, right? Yeah, it was a ghost, I was the ghost writer. And a lot of fun. Mikey, you know? You did have a good time? I had a real good time and he was real nice to my family, too. Like I took my daughter there and at one point, he—I had been interviewing Michael Jackson and every now and then—the trainer brought in his monkey, he had this monkey called Bubbles, who’s still alive, by the way. And Bubbles is still alive! Yeah, Bubbles is, last time I checked, which was maybe 18 months ago. Bubbles is alive and retired. Oh man. So, spending all this time . . . having done both the unauthorized and the authorized [biographies], did you ever do any authorized ones where you approached the artist? No. . . . I tried . . . when the book I did with Levon Helm, This Wheel’s on Fire came out, we sent the galley proofs to Bob Dylan and he wrote this incredible blurb; the first and only time he’s ever blurbed for anything, I think. And it was just this . . . it took up about half a page! That book’s still printed, and we still use the blurb! And so, I wrote to . . . I was casting around what to do next and I wrote a letter to [Dylan’s] manager . . . saying, “Listen, I know Bob really liked this book and . . . there’s a rumor that he’s considering doing something like this and I just wanted to put my candidacy,” and never heard back. But then a few years later, he wrote this book called Chronicles, which is pretty much in the same register that I used for Levon Helm’s voice, but from Minnesota rather than from Arkansas. So, I have never approached anybody . . . And when I do get approached now, it’s more for celebrities other than musicians. You know? Famous photographers, famous actors, and stuff like that, and I turn them down. We turned down, me and Peter Simon turned down Lady Gaga a couple of years ago because we just figured we were too old and we didn’t want to go on the road with her. . . . It was a nice offer. Well yeah, that brings up the next question, is it always a prerequisite that you’re a fan of these musicians? That you’re going to have to be able to tolerate doing a year to three years to . . . I could have learned to love Gaga, I suppose . . . but I didn’t want to, you know? The only time that I took on an assignment like that was when I was approached by Duran Duran’s management. And I didn’t have much respect for Duran Duran at the time. This is like, maybe 10 years ago . . . long after their heyday. They were getting back together and they wanted to write a book. And then I started listening to Duran Duran and I realized that this was a pretty amazing product. And it was product too, it was music, but it was product. Then I went to England and did a little tour with them and I realized—and I had never known—what a great band they were live; incredible band live. And so I wrote a proposal, we got over $1 million advance and when it was time to sign the contract, and I had explained to them that the way I work with bands, like Aerosmith, was that I get half the advance and the musicians split the rest. Because, you know, someone’s got to write the book! And it worked out pretty good with Aerosmith: they made a lot of money! The book was called Walk This Way. And so the Duran Duran book was going to be my next band book and when it was time to sign the contract, they said, “Well, we’re not splitting this. You can’t have half the money. There’s five of us and there’s one of you, you can have . . .” you know, and so I just walked away from it. . . . They kind of fired me, and just said, “We’re not giving you what we said we were going to give you. . . . You’re out.” And that book never came out. That would b a pretty interesting read. Yeah, it’s on my list of what to do next, maybe, you know? I’ve written, published 19 books now and, you know, there should be at least one more, you know? Did you notice that you’re in [Gold Dust Woman]? I did! Thank you so much for that. Well, thank you very much for going to all those shows. Oh, it was a blast. That was fun. You’re very Rhiannon, you know . . . Whatever that means! You’re indelibly immortalized as that, until you start writing your own books! But it’s funny, though, because around that time, like, all my friends were having kids and, you know, my job at the paper was a glamorous one where it was, “Hey, Pat Healy’s got a plus one for me,” you know? And then all my friends started having kids [and not being able to go to shows] and we met and it was like, “Hey, let’s go to shows!” We saw Wu-Tang, who else did we see? Lindsey Solo, which was very interesting. We saw Stevie at The Pavilion. Yeah. And then saw the Fleetwood Mac reunion with Christine [McVie]. No, we went to that together! No, I went by myself and reviewed it for The Metro. You went by yourself right after the marathon bombing . . . Yes, “Boston Strong,” right! Oh, no, there’s something, you’re right! ‘Cause I was there till 2014 and I think we went in like the fall of 2014. That’s exactly right. So yeah, there were more things than even I remembered. It’s part of the research. So, thank you. No problem. Yeah, with [the writing of each book] being such a long process, ‘cause yeah, that was four years ago, that was the last time we saw them, I don’t even know when we saw Stevie and Lindsey . . .
. . . I saw Stevie a year ago at TD Banknorth Garden: Worst seats in the house, but I liked it because . . . it was then that I understood that there were four parts of her audience. There were old ladies her age, their daughters in their thirties and forties, their daughters between 12 and 16 or so, and then the gay guys who were actually dressed like Stevie. A lot of them. Right, right. Did you ever go to the Land of a Thousand Stevies, or whatever it’s called? No, I like that though. Night of a Thousand Stevies, right? Night of a Thousand Stevies. I don’t know if the Night of a thousand Stevies—I haven’t heard about it in some time—I think it may be over. I wouldn’t be surprised. Yeah, it’s one of those things that, you know, as I’ve come to live a certain amount of time, to watch audiences dissipate on age. And availability and I’m guessing that the group who was doing it aged out of it and the torch was never passed or something. And it is a funny thing to realize ‘cause, you know, when you’re first going to shows, you don’t really take stock of that, you’re just there with a bunch of people. Mostly your age. You know? Or younger, not much older. Yeah. So, when you’re writing these books, like I was starting to say, I don’t even know what year it was when we first saw Stevie, or first saw Lindsey, but it was like 2011 maybe? 2012? I don’t know, but you spent . . . what’s the longest you’ve spent on any of these books? The Gold Dust Woman, five years. It was five years? Okay. Yeah, but my wife died in the middle of it. You know? But I kept researching, I kept doing all the research while she was ill. And that was like two years and after she passed, the people around me said, “Don’t write the book now.” Let it marinate. Like whiskey . . . think about it for a year and don’t try to write, you know, so I took a year off, lived on credit cards, [and a ] lot of support from my neighbors and family. Your agents, too? Were they understanding? Yeah, we tried to buy the book back from St. Martin’s Press. I just said, “You know, we’re not going to make the deadline, here’s the advance back.” A hefty advance, too. They said, “No, no, no, no.” The timing worked out real good, actually, because I wrote the thing last year and it’s just been published and it’s selling real well . . . We’ll know on Wednesday whether or not it hits the bestseller list. . . . That’d be nice but if not then, you know, onto the next thing, whatever that may be. Well, what is the next thing? I don’t know. Maybe Boston. You know, “More Than a Feeling.” Great story! The funny thing about Boston is that everyone that even approaches it gets sued. The principal of Boston is . . . currently in court with the guitar player over some remark that the guitar player, you know, passed that apparently caused a gig to get cancelled or something like that and this was written about in the Boston Herald a couple of weeks ago. They did a thing about the Gold Dust Woman in The Boston Globe. And they said, “What are you thinking about next?” And I said, “Well, maybe about Boston,” you know? “I’ll probably get sued, but on the other hand, I’ve never been sued before, at least it would be a new experience.” So the Globe hits . . . the front door about 6:00 in the morning. At 11:00 in the morning, I got . . . an email from a libel lawyer. It took five hours for a libel lawyer [to get in touch]. Now, fortunately, the libel lawyer was saying, “I’m the libel lawyer who represented The Boston Herald when the guy from Boston sued them, and not only did we win, but we got $170,000 in costs off of him. So, here’s my card,” basically. But on the other hand, you know, maybe, you know, there are other ideas, you know? I mean, maybe a Duran Duran book would work. A book about the ‘80s. . . . People like reading about . . . then . . . maybe there’s another Led Zeppelin book, you know? Robert Plant since Led Zeppelin . . . I mean, that’s a whole story and . . . he left Led Zeppelin in 1980, so that’s most of his life and he puts out an album every couple of years. Yeah. With all these books and spending all this time either with these people, physically, or immersing yourself in their music, which artist do you still find yourself going back to? Well, I wish Bob Marley was still alive. He had a great laugh, you know? Anyone I worked with I enjoyed spending time with, some more than others. Obviously, Levon Helm was a gas. We went down to . . . he took me down to Arkansas on the bus and we, you know, went to his hometown, Turkey Scratch, Arkansas. Mick Fleetwood, you know, snorting cocaine in Malibu for a year . . . hanging out with Michael Jackson and his monkey, you know, I’d go back to. . . . if I could see any of them tomorrow for lunch, I’d be thrilled. Not so much Duran Duran, but then, I didn’t really do that book, you know? Aerosmith, I went around the world with Aerosmith. I was like embedded . . . Private jets, five-star hotels, and they were doing it sober! That’s a great story . . . You get to Tokyo and instead of, “Where are the hookers? Where’s the drugs? Where’s the booze?” it was, “Where’s the meeting?” The AA meeting, you know? The first thing you do after you check into a hotel is you’ll be in some church basement in Roppongi with the five guys in Aerosmith and, you know, a bunch of alcoholics. . . . You know, Western alcoholics . . . from the embassies and stuff like that and, you know, “Hi, I’m Steven,” “Hi, Steven,” you know, so, I mean . . . Frankfurt, Germany, I went to AA meetings . . . all over the world. Of course, that was a book about, you know, the Toxic Twins getting their lives back and making records again and it’s . . . the only redemption story that I’ve written. Although Stevie Nicks, Gold Dust Woman, in a way is, you know, she’s been through rehab twice. She got her . . . she was a trainwreck that got her train back on track. Which is, thank God because, you know, it would have been a very dark story otherwise. A lot of these stories do have darker sides and do you feel that as you’ve gotten older and had more experience dealing with people and writing these people’s stories, have you gotten kinder at all, or is it just that the subject material isn’t as dark? That’s a good question. The last two books have been about women artists. Right, Carly Simon [was the subject of your previous book, More Room In a Broken Heart]. Carly Simon and Stevie Nicks, and so, and you do get . . . some people get more compassionate as they get older. I don’t know if that’s me or not. When your wife dies in your kitchen, you probably get to be a little bit more compassionate, like me, but . . . it just depends on the material. It really does, you know? Like . . . and also, it’s commercial; you’re just not going to want to write a trashy book about Stevie Nicks ‘cause her fans won’t buy it. . . . And there’s no point. But, you know, I’d happily write a trashy book about . . . Duran Duran or Blackberry Smoke, or whoever, whatever band is in today. If it’s a trashy story, you owe it to the reader to . . . partially acknowledge facts into a decent narrative and you don’t have to go sleazy, you just have to tell what happened. . . . And you don’t have to tart it up . . . the facts tell the story. Yeah. Well you do also, throughout all the books that I’ve read, you do put a little bit of yourself in there as well. Whether it’s your opinion of Kenny G. in the Stevie Nicks book . . .
Or, you know, then there’s the LZ-75 book where you’ve got a whole narrative. Yeah, that was about me, right. Yeah. So that was your most autobiographical work . . . The only one. The only one. And there was just a little bit about me, it was mostly about being on tour with Led Zeppelin. But it was how I got that story, you know? Which was kind of a fun thing, can be a fun thing to read. Right, right. It’s like Rosencrantz and Guildenstern Are Dead or whatever. And that’s, that’s where I break the narrative and I get the reader up close so you can smell the hairspray, you know? And see the thick glasses that she wears and . . . just sort of up close and almost making contact with the subject. But it’s not generally a good idea unless you have the material. And you want to try to avoid the suppositional stuff like, “He must have felt,” or “He or she might have thought.” That’s like the kiss of death in these books. You know? You just want to stick to it, what you know and not try to. . . . You can do it if it’s an authorized book and they’re telling you. But in an unauthorized book, it’s a very bad way to make transitions, you know? If somebody were to write your story, if not you, would you want it authorized or unauthorized? Doesn’t matter. . . . I wouldn’t get in the writer’s way unless I knew it was a hatchet job. In which case, I would try to have the author killed. Or maimed! Or get out the cricket bat and do the card, you know? No, I’d cooperate with anyone because . . . I mean, all of these books, these 19 books, each one is a chapter, you know? Some of the material is quite lurid. . . . I had to leave out [a lot]. I could write a book about this stuff that I had to leave out for legal reasons. On all these books. Not Stevie and Carly Simon, but the band books. . . . I mean, these guys weren’t kidding around, you know? They came to play. . . . And play they did. Say you were an artist, you know how when The Beatles do The White Album or you do your experimental thing and you know you’re on top of the world and everybody’s going to buy what you do, even if you’re out there on a limb. What would be the book you’d write, if you knew people were going to buy this? You don’t have to have any commercial concern. You knew people were going to buy it, because you mentioned earlier a commercial concern: You want to know how to approach a Stevie Nicks book, because the fans are going to view it. I see what you mean, yeah. Because the fans are going to review it and . . . I think I might do a book about . . . my great grandfather was a confederate rifleman, tenth Arkansas, General Sterling Price. He fought in the battles of P Ridge, Wilson’s Creek, and Helena. And he joined the confederate army, his brother George had joined the union army. I always thought there’d be a really good book about Missouri in the Civil War, using this as a framing device. It was basically, the two sides just started to kill each other. And then there were . . . they killed the wives and the kids too, burned down the farm. . . . It was this horrible, guerilla war in Missouri, and I’ve…my father’s from Missouri and I have a lot of cousins who live there and it’d be kind of fun to go down to Missouri and write about . . . follow the footsteps of old grand, great-grandad, who got his heels shot off at the Battle of Helena. . . . And Levon Helm and I walked up that hill, overlooking, there’s a confederate union battery overlooking, keeping river traffic under control and my great-grandfather went up the hill and got his heels shot off and Levon Helm and I walked up that same hill years later. Wow, did you feel any echos of . . .
No, no. . . . Not really, but there were some graves and stuff like that. And it was sure echos, yeah. But there were also a lot of black kids like drinking and smoking crack, amongst the confederate tombstones, so. Yeah, and they were looking at us funny. It’s kind of violent down there in that part of Arkansas. But Missouri’s different. So that’s the answer to the question. I feel like that could have a commercial appeal, though, you know? Yeah, it’d be sort of . . . what they now call “creative nonfiction.” Which means you can make stuff up but, you know. Right. Was the Howdy-Doody book the only non-music book? The Howdy-Doody book was about, my father was the director, writer and director of The Howdy Doody Show. So that was a kind of history of early TV. And after Hammer of the Gods, I was sort of blown out about writing about a band and I wanted to do something else and write about my . . . it was basically, my father was sort of a writer who didn’t write after he stopped writing for TV. So I basically got him to write the story of his time with The Howdy Doody Show, then I just re-typed it and with sort of my own stuff. And then, I went and interviewed the people he wrote about. And so, it was kind of a little collaboration there. He didn’t want his name on it, but I dedicated it to him which he liked. He only passed a few years ago. Oh, he’s alive? Oh my God. Is he 100? My mother’s 98 and my father’s 100! Wow. Oh, it was your uncle a few years ago. My uncle . . .
Well yeah, that’s where we first talked. I was working on his estate and doing other things, yeah. Right. So, thinking about Hammer of the Gods, and that was your first huge success, right? First New York Times Bestseller. First of five. Yeah. The Guns ‘N’ Roses one was there, right? Fleetwood. Fleetwood was even longer. Walk This Way was … Moonwalk was number one. And this has a pretty good shot. We’ll know on Wednesday, fingers crossed. You know, if it doesn’t hit the list, it’s still selling real good. And kind of on to the next thing, you know? Yeah. Is that a nerve-wracking time period, when you are working on these books and you never can know for sure how they’re going to do? You never know. You never know. Sometimes, the book becomes an orphan. You’re halfway through, your editor quits or gets fired, because only the editor who signs you up is going to see this book to press. For any other editor, it’s just a burden. Right. Right, unless it just, it sings, right? Unless the president of the company is on your side, which has happened to me, you know? But sometimes the company . . . the marketing director leaves the month before publication and then the new person doesn’t have time to . . . it’s just a crap shoot. It really is, it just, you know, the timing is everything but there’s nothing the author can do about it, really. If the Stevie Nicks book had come out two years ago, like it was supposed to, I don’t know if it would have passed that “who cares” test. She’s a bigger star now than she was when we. . . I mean she’s like the fairy godmother of rock. So it’s a good time to do this now and it’s just fate, you know? Well, it is, it feels a lot like your career parallels the music industry, in a sense. Yeah. Rock is dead and so am I. Me too! They’re just not buying records. They’re not going to shows as much as they did. I came of age when the music business was bigger than Hollywood. It was the biggest money component of American culture. It was bigger than publishing, bigger than theater, bigger than radio, bigger than anything. Individual bands were selling 30, 40 million records. It’s a culture that doesn’t exist anymore, you know? . . . Even vinyl made a comeback. It’s all kind of cultic now, you know? . . . The fans are divided into niches. The rock world was the largest audience for anything in history, of the planet. Fleetwood Mac has sold over 120 million records, you know? There’s some religions out there that aren’t that big. So, I’ve been privileged, from my early twenties to be narrowcasting into what is still the largest audience for anything in history and that’s the rock audience. Right. Well, it’s interesting that you passed up the Gaga opportunity because that almost feels like it could have been the . . . most contemporary person who is still attracting an audience based on a career. True. But if we had gone on that tour, we would have been disappointed because she collapsed halfway through. . . . She had hip surgery or something. . . . Also, she’s too young to have a story, you know? You need a beginning, middle, and an end and, you know, she has a beginning, and now she’s just coasting into the middle. But . . . if I’m going to write a book, I want it to be an epic, you know? I want it to have a, you know, a sweep. And she doesn’t have that sweep yet and again, Stevie Nicks may be the last rock star; certainly, the last female rock star. I mean, Taylor Swift is not a rock star. She’s a pop star. And same with all her contemporaries. Will we see another, you know, another Debbie Harry, another Janis Joplin? A woman fronting a band and . . . nailing it, you know? I don’t know. Do you read other rock books? I do blurbs for them. I pretend to read them and then write these outrageous, definitive, the real story, you know? I just do this as favors for editors, you know? No, it was like post…New York post CBGB’s. Like at the turn of the century. Oh, right yeah. Did you read it? The one I’d really like to read is Jimmy Webb’s memoir, which I hear is great. . . . I hear it’s really, really, really, really good, you know? I have started several rock books. But, you know, a lot of them are written by academics now, you know? . . . Or people with PHD’s and stuff like that. There’s a new book about Joni Mitchell that’s sort of . . . I’m competing with now, written by a guy. And I’m quoted in it. Writing about from, you know, writing about Led Zeppelin’s reaction to Joni Mitchell from Hammer of the Gods. That’s sort of a funny feeling, you know? “I’m part of this?” No, I’ve never read . . . I can’t think of another rock book that I read or, at least, that I read all the way through. There’s some I’d like to read that haven’t been written yet, you know? I’d like to read a book about the real story of Debbie Harry and Blondie. Yeah. Take a book like Hammer of the Gods and how much work do you do on that still when you have to do a new edition and…? Oh, I have a mass . . . I clip everything, you know? . . . All of my books have, like Hammer of the Gods, the fifth English edition is coming out…I’m going to London, actually, to put this thing to bed with McMillan. And update . . . stuff. The other thing about Hammer of the Gods is that it was supposed to be a mass market paperback in 1985 and at the last moment, the editor said, “This should be a hardback.” Cut 10,000 words. So, it was 10,000 words cut out of Hammer of the Gods that could be put back someday because it’s…backstory stuff about Jimmy Page. There was mostly…none of it was cut out for content, it was all just obsessive fan stuff. So, cut this out…and it came out as hardback at the last minute and hit the New York Times Bestseller list, the rest is my history. But, on the other hand, you could write a whole book about Robert Plant after he left Led Zeppelin. Nothing, you can’t do anything about it. We paid him a lot of money to spill his guts. It was the only time I’ve ever paid a source. But yeah, he wouldn’t…we paid him $5,000 which was good money in 1985. And we couldn’t even use everything that he gave us. ‘Cause of some of the stuff was really outre you know? And some of the stuff, he said, “Listen, the band got blamed for a lot of this stuff,” but it was really The Who. Yeah, and Richard Cole was one of the tour managers, so…he just put Led Zeppelin through their pace. And remember, these guys were 19 years old. Robert and the drummer couldn’t drink. You know? They couldn’t go into the bars after the shows. . . . They’d never seen a policeman with a gun, they’d never seen a California groupie, you know, coming onto them, literally grabbing them. The first time I was in one of those hotel suites, I didn’t put this in LZ-75, damn me, but when I went to that hotel suite, I had this William Burroughs interview that Jimmy really wanted. And Richard Cole opened the door and he had a pair of girl’s underpants on his head, lacey undies on his head. That was a book I wrote while I was researching the Carly Simon book. I wanted, you know . . . I’ve written some books just ‘cause I like to write every day and while you’re researching in the morning, if you have a couple hours in the afternoon, I just retype my lost notebooks from LZ-75. The same thing has happened with the book about Morocco, about Jajouka, I did that while I was hanging out with Levon Helm in Woodstock, doing the research. That’s cool. That’s kind of like, there’s this one scene where, I forget what it’s from, but Brian Wilson . . . .no, it was Linda Ronstadt’s talking about Brian Wilson, they’re working on some composition and he’s like trying to write this song and then he, to clear his mind, plays some Rachmaninoff Sweet, or something and just, he’s like, “Okay, now I got it,” and he just goes back to the simple chords, it’s just kind of, what is that Picasso quote, “Inspiration will find you working,” that’s Picasso, right? I don’t know, I’ve never heard that one. Yeah, it’s like [the gist of it is] if you’re doing something, inspiration will come. You know? So what kind of things are you busying yourself with writing now? That’s a good Brian Wilson impersonation . . .
And so Don Henley and his date come in and Don Henley’s got a greatest hits album, yellow, gatefold Beach Boys, Endless Summer, it’s called. Don Henley goes into this devotional five minute rap about how it influenced . . . recently came to California from Texas, was to follow the vibe of the Beach Boys and make it in the music business, the call of the surf and, you know, Brian’s big influence, etc. Brian’s like nodding off and he’s getting bored and he’s like, “Alright, fella, give me the album,” and he . . . Andy gets him a Sharpie and he goes, “What’s your name again? Don? To Don…thanks for all the great music. Love, Brian Wilson,” and he hands the thing back and so Don…other people start coming in and Don and his date go over and stand against the wall, just to be in, you know, in the presence of the great master. After about ten minutes, Brian Wilson notices that the people in the dressing room seem much more interested in Don Henley, like in awe of this guy. [So Brian] calls Andy, “What’s that guy’s name again?” “Don, it’s Don Henley from The Eagles.” “Oh . . . what of The Eagles?” And so he’s like, “Come on, Brian! Like ‘Witchy Woman’ and ‘One of These Nights’ and, you know, ‘Hotel California.’” Brian Wilson thinks for a minute and he goes, “Tell him to come back over here.” So, Don Henley comes over, Brian’s like, “Give me that record! Where’s the Sharpie?” And he, Don Henley goes, “Oh, you gonna write something else, Brian?” And Brian takes the sharpie and he crosses out “great.” And he hands the record back to Don Henley. Wow. That is amazing. I love, though, that like, watching you tell that story, the way you light up telling it, I can tell, like, that it still gives you that something to convey these stories. We’re storytellers, man. You and me, that’s what we’re doing. Yeah. It’s great, it’s great. The best stories are the ones that . . . you can’t print though. . . . You know? Like, you can’t … there’s no context for that, it’s not even a story that works on…would work on the page, you know? Do a Mark Twain, then. Have it published 100 years after your death. Oh yeah, the posthumous book: sell it now, but publish it later. So, we began the interview talking kind of about you as a musician and you became a musician again after Morocco, and I see a guitar leaning against the television set, so are you still finding something in listening and playing? Yeah, yeah. I play a lot of the music I learned in Morocco. On the flute, just by myself, and the cats like it too. Cats are like cobras. If you start playing, these sort of shepherds’ tunes on the flutes, these are old, old tunes, man, they go back to the caveman stuff. And the cats come and they look at you, it’s like, it’s almost like the cats are going, “Hey,” you know, “this cave isn’t so bad after all, there’s a fire and the guy’s playing music,” you know? Yeah, “the guy.” They don’t know your name. And yeah, “the can opener is playing music. And there’s, you know, plenty of mice and rats around and chipmunks,” you know? So yeah, it’s, you know, it’s a way to get back to the, you know, the very, very primal things. Here, I’ll play you a tune.